When I first started working on this post I was 10 days from unveiling 43 paintings. As I sit in Casa Sol a dreamy tea shop that reminds me of Alice in Wonderland or the Kensington Palace tea place in London (trust me this is way cheaper), I looked back at all of my pictures and have learned that discovery/exploring is crucial in my creative process. It was almost like God knew that I could run into a block while creating my art work. 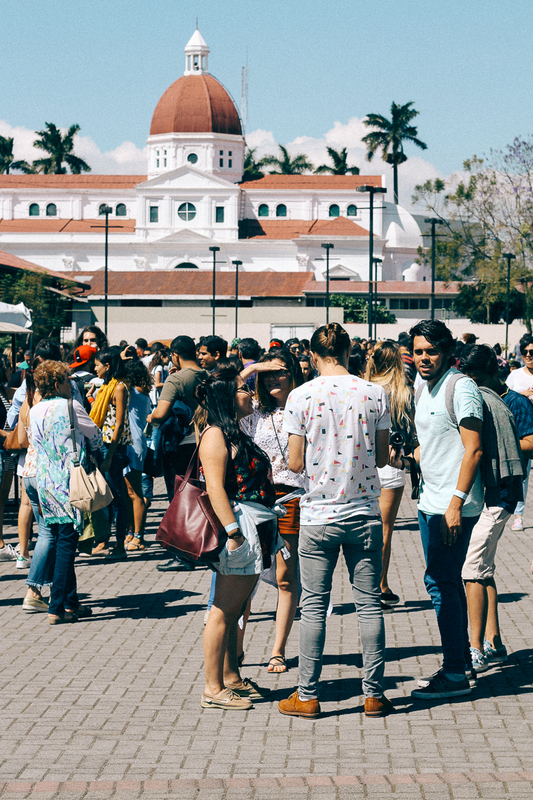 So, right in the middle of my production timeline (yes, I had one-because I also think analytically for a large portion of my day), I decided to go on a trip to Costa Rica to go to a design conference (FIDCR). This trip was more "learning" than play, so I didn't get to explore as much as I would. Needless to say, I made time to go on little walks in the city center on certain days and observing the life in San Jose. I went to FIDCR Festival Internacional De Diseño. I took a 17 hour bus ride through Nicaragua, that's right, plane tickets were almost as expensive as flying to the US, but I eventually arrived. Welcomed to the Solis's home, they are old family friends, San Jose feels like an easy place to immediately plug in. I had been there in the spring of 2015 to visit them and some friends from college, so I knew how to get around and cool places to go to. I spent some time with my host family, but I spent the majority of 3 days at the conference, and a couple of afternoons simply exploring. One of the events that was related to the conference was the Art City Tour, so we got to go to all the museums for free. We hopped on little buses that had tour through several cultural centers in the city. Costa Rica has amazing creatives and this conference brings in a great international crowd. San Jose is a rich city full of color, culture and downtown San Jose is quite the fun space for me. I normally don't go out on walks in Tegucigalpa and after spending time in Europe where I walked everywhere, I was glad I explored some of the city on foot. I had 2 goals for my photography on this trip: I wanted to notice light in it's natural environment and how that played with shadows and shapes as well as focusing on the people in the city. Since I did have much time between conferences a couple of times I sat in the middle of the courtyard of Antigua Aduana, the amazing warehouse where the conferences were held and I people-watched. It was full of what you would call hipsters, place all of the art students and creatives in one place: taking pictures was a blast because everyone was trying to show their personality through their clothes. People in Tegucigalpa will sometimes stare if I wear a hat or overalls to a regular work day, here I was in San Jose wearing basic stuff, ha. All that to say, FIDCR had an amazing line-up and I was overwhelmed with what the speakers shared. The director of global marketing for Nike spoke, amazing illustrators from Mexico, muralists from Japan, @drawingsformygrandchildren, etc. I could tell you so much about what I learned just by hearing these people. In one sentence here's what I learned: once you find a passion, work hard, work with excellence, dream bigger, create prototypes, & have fun along the way. Without using our imagination the world could get stuck where it is and we need people who are forward thinking. This creative agency has made some really cool projects. I went to a Q&A, and while we may have different beliefs I respect the work they've created and learned much from what they had to say. All in all I was absorbing as much as I could and I'd love to go back. At some point I need to go back and learn how to surf, and maybe one day I'll go back to have an art show at the Museo de Arte y Diseño Contemporaneo (hopefully sooner than later). Throughout my trip, I was constantly introducing myself to knew people at the conference. I met amazing artists and designers along the way. As I shared what I was working on, many of them encouraged me to keep going, keep growing and pushing. So as I said in my previous post and 2 of the speakers at the conference: "Be Bold". I could say way more about my trip to Costa Rica, like all about the amazing food I ate but for now I hope you enjoyed some of my favorite pictures. Thank you Solis family for hosting me & thanks to all the friends who encouraged me to go to San Jose, I'll come back for sure. Pura Vida!